Will's Birth Story - Six Months Later! 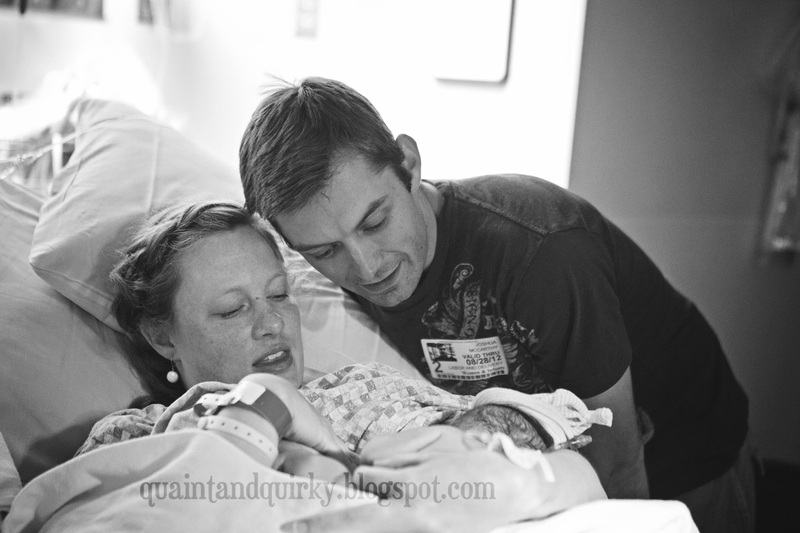 Just like with his sister, Will's due date came and went with not so much as a contraction. 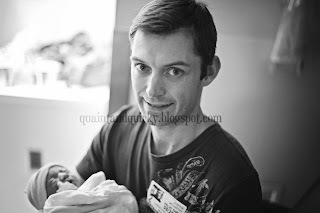 I had never felt a naturally occuring contraction and couldn't really remember the pitocin-induced ones that I had with Amelia. However, I was awakened one Tuesday morning five days after I was due with some pains that seemed to be coming and going. I started timing them with my phone contraction timer, but around six in the morning, they subsided altogether. 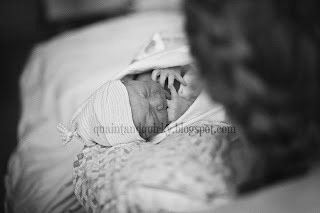 Nevertheless, when I woke up that morning, I called my mom to tell her that I had been having SOME kind of contractions. She left work early to stay with Amelia and me. 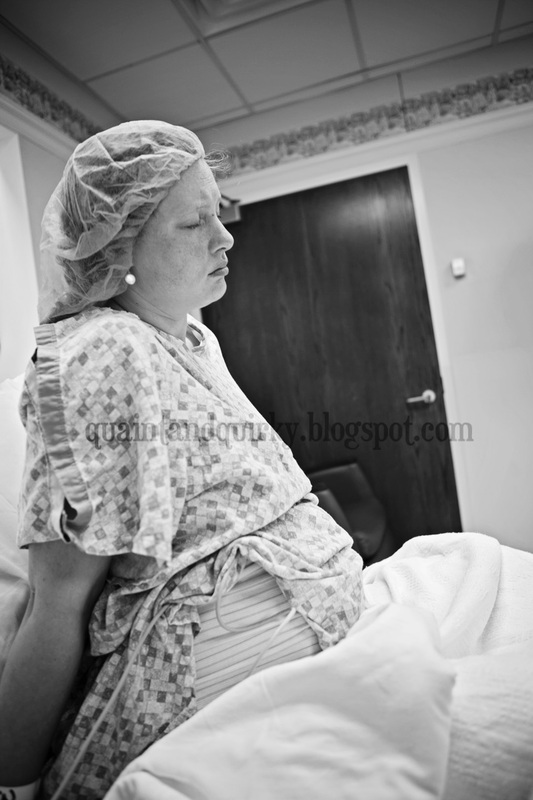 The contractions picked up again, but they were short and far apart for most of the day. Mid afternoon, my mom went home for a bit, but promised to come back when I needed her. Around dinner time/ Josh coming home time the contractions really picked up, but I knew I had to wait for the 5 minutes apart, lasting a minute, for an hour. They weren't anything that close together or long. Josh came home late because (get this) he stopped at the hardware store to pick up shelves for my craft room closet (my second-favorite decision of the day). After dinner, the pain was getting a bit unbearable, but the contractions were like 10 minutes apart and I could still walk and talk through them. 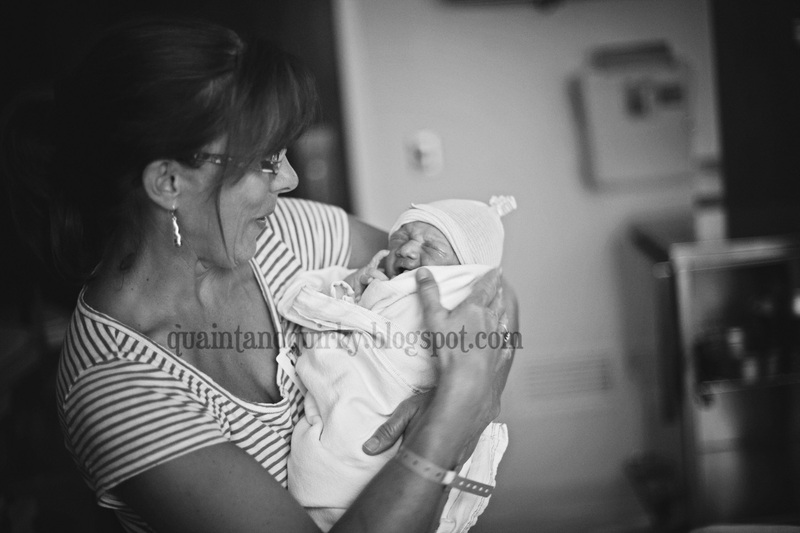 Still, I decided to call the midwife and alert her that I was in labor. Being my second baby and because I had had off-and-on contractions all day, she decided that I should come in (my favorite decision of the day). Josh hadn't packed a thing, so he was throwing clothes and toiletries in bags while I was being mean and in pain and we waited for my parents to come take our baby girl. While in the car, my contractions jumped from 10 minutes apart to 3 minutes apart. We never even came close to the 5-1-1 guideline. Thank GOODNESS the midwife had me come in anyway! Josh decided that this was a great time to drive 95 miles an hour down the highway because he "didn't get this experience with Amelia." We arrived at the hospital around eight or eight-thirty. In triage, they called my midwife (who was at the hospital anyway) to check me and I was already seven cm. I had expected, mmm, four, maybe five. She was pretty shocked as well, since I was still pretty functional. I was very much looking forward to the epidural, so they rushed me up to delivery so I could get that in a hurry. 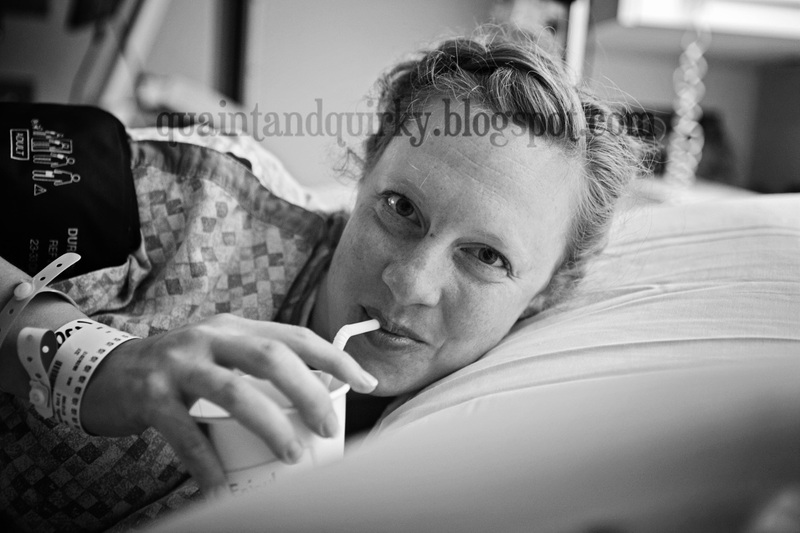 However, the anesthesiologist had just been rushed into a c-section and they were very doubtful that she was going to make it in time for me. Grrrreat. I know there are lots of stalwart drug-free laborers out there. To quote Elphaba, "I'm not that girl." They prepped me anyway, just in case, and the midwife offered to break my water so that I could have a quicker drug-free delivery. No thanks! 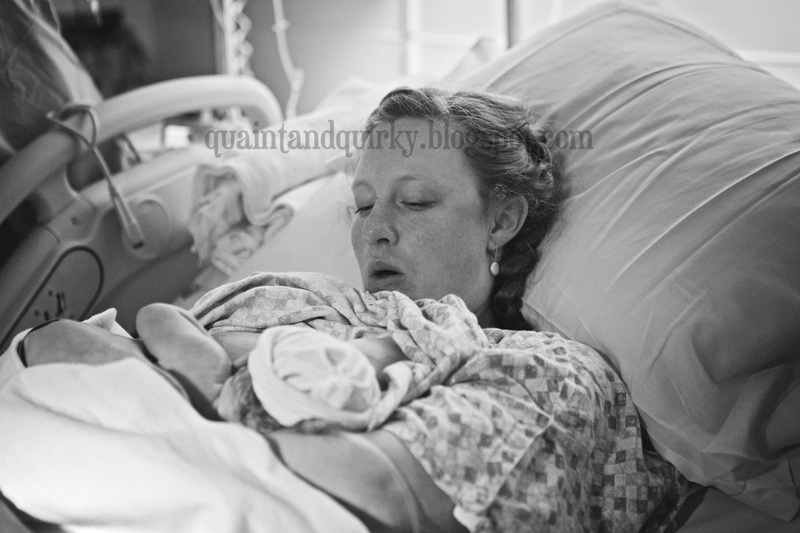 With Amelia, I never got to the "Wow, this really really really hurts" portion of labor because I was induced and was always in control of my pain. I got the epi at 4.5cm with her. With Will, I most certainly got to the, "Wow, this really really really hurts" portion and I did NOT want to experience something called the "Ring of Fire" while still feeling my lower half. Miraculously, the anesthesiologist DID make it in time to give me my epi and I was completely happy and pleasant after that. The midwife broke my water (she asked me if I wanted him born that day, or the next and I chose that day because the next day was an ugly prime number and I hate prime numbers), I was fully dilated, and they got me set up to push. 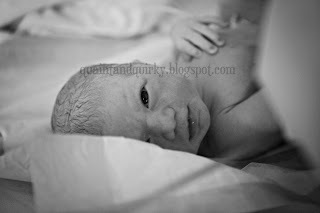 Ten minutes later, a little before midnight, Will was born. He was tiny - almost a pound smaller than his sister absolutely miraculous! Nursing went MUCH better with him. It wasn't without its complications, but, overall, it was a much easier experience!